With a shared language and cultural roots, many educators in Taiwan assumed the island would be an appealing destination for the masses of mainland Chinese students eager to pursue higher education in the developed world. But after opening the doors of its universities to mainland students for the first time last year, Taiwan is still struggling to spur interest. Mainland Chinese students: Not interested in Taiwan. For the second year in a row, the island has filled less than half of the 2,000 university spots reserved for degree-seeking mainland students, according to numbers provided to The Wall Street Journal by Taiwan’s Ministry of Education. The ministry says 987 mainland students enrolled this fall, a slight bump up from 928 last year. Taiwan has been eager to attract mainland students to make up for sagging university enrollments resulting from an overabundance of colleges – a problem set to be compounded in the future by a perilously low birth rate. The education ministry has said that a large number of the island’s 165 universities face mergers or closure. But strict regulations set by the Taiwanese government have been a barrier. Because the Taiwan government requires mainland students to meet a high academic bar, those who qualify to come here generally have plenty of other educational options. And while universities in places like Hong Kong and the U.S. offers scholarships to sweeten the deal, Taiwan doesn’t. Last year, 4,582 mainland students enrolled in degree-granting programs at Hong Kong universities, five times the number coming to Taiwan, despite Taiwan boasting many more universities. Mr. Li added that a wariness of the island’s famously rowdy politics also made some mainland students reluctant to study in Taiwan. The ministry told The Wall Street Journal on Wednesday that it is considering easing regulations to attract more students. 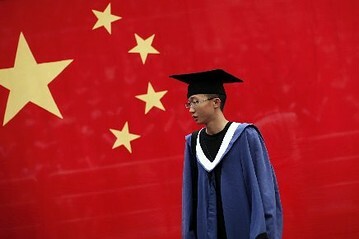 “The direction for loosening the regulations includes possibly increasing the number of mainland higher education institutions that are recognized, permitting universities to award scholarships to mainland students, and for those students to be able to work part-time,” a ministry spokeswoman said in an emailed response to queries. Taiwan President Ma Ying-jeou has voiced support for relaxing the rules, which currently prohibit mainland students from working in Taiwan, taking exams for professional certifications or staying after graduation to find a job. Taiwan’s legislature is also considering providing mainland students with national health care coverage. Mainland student Su-King Liu, who arrived in Taipei this month to begin a bachelor’s degree, said some of her friends ruled out studying in Taiwan due to the restrictions. Mr. Li, who also teaches cross-Strait history at Shih Hsin University, says he sees his mainland students gain a more nuanced perspective of Taiwan during their time on the island. As for their Taiwanese classmates, he says they gain from the exchange, too.